All users added to your KnowBe4 console have a personal profile which summarizes their performance on phishing security tests and training campaigns and provides their risk score and Phish-prone percentage. User information is also contained here and can be manually modified as needed. After you add your users to your console, you will see them on your user list beneath the Users > Users tab. Click any user's name or email to access their personal profile. Accessing a user's personal profile allows you to modify their details and view their phishing, training, and risk history at a glance. Your general user details will list all information about that user and list the groups that the user is a member of. There are several ways to modify a user's information. We've placed them in order of what we most recommend, to make managing your user's information as easy as possible. Through automatically syncing your user list with Active Directory. As a best practice, we recommend modifying your user details in Active Directory when using ADI and allowing the next ADI sync to update your user's information. If you're using Active Directory Integration (ADI) to sync user information, most settings will be uneditable through the other methods, unless you configure that user as not managed by ADI. By importing a prepared CSV. 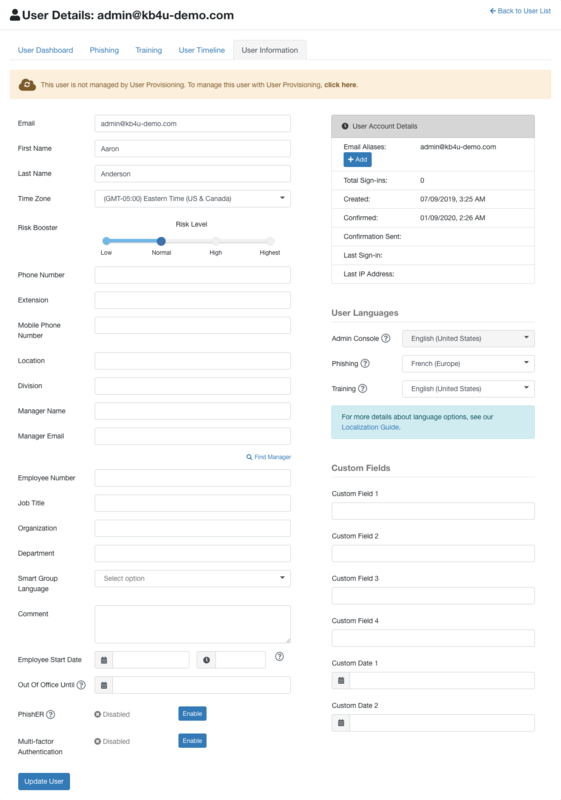 From the Users > Import Users > CSV Import tab, you can import a CSV containing your users' email addresses, along with any additional information you'd like to include about your users. Be sure to follow the formatting steps in this article when adding user fields and details to your CSV: How do I import users with a CSV file? Click the arrow to the right of the user you'd like to modify details for. 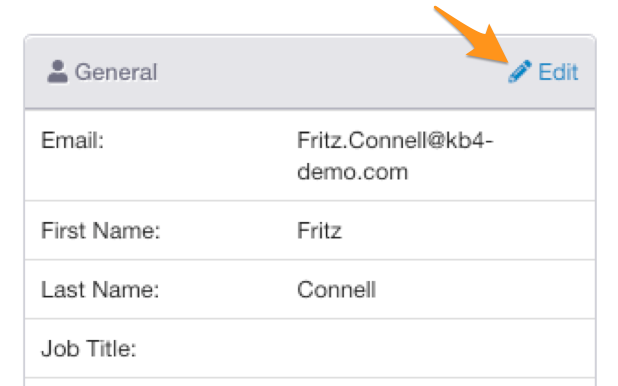 While on the Users > Users tab, click any user's email address or name to view their personal profile. Click Edit in the General area on the top right of their personal profile. You can enable multi-factor authentication for your users as an added layer of security. We strongly recommend that you enable MFA for any users with elevated security roles or admin access. To learn how to enable MFA for your users, review our Multi-Factor Authentication guide. 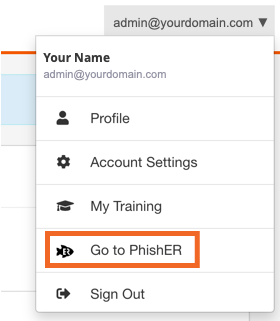 You can enable or disable access to PhishER for admins and users by checking the PhishER Enabled box. By default, PhishER will be enabled for account admins and disabled for non-admins or users. 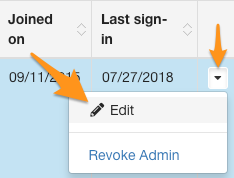 As an admin, you have the option to disable and then restore your own PhishER access. 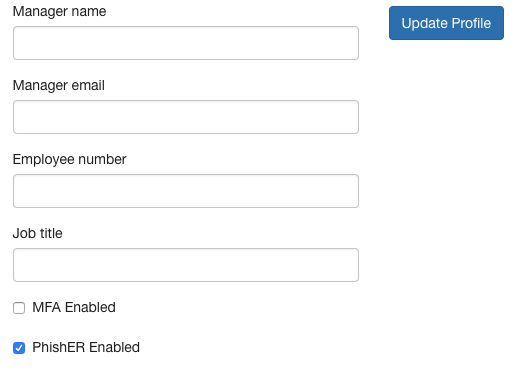 If PhishER is enabled on an admin or user account, a Go to PhishER drop-down menu option will be available by clicking on your email address in the top-right of the KnowBe4 console. Sign in count: How many times the user has logged in to their KnowBe4 account. Created at: When the user was added to your KnowBe4 account. Confirmed at: When the user confirmed their account. Confirmation sent at: When the confirmation email was sent to the user. Last sign in at: The user's last recorded login. Last sign in IP: The IP address collected when the user last logged in. The Personal Risk Score area of the user profile displays charts illustrating that user's current risk score, risk score history, and risk score factors. 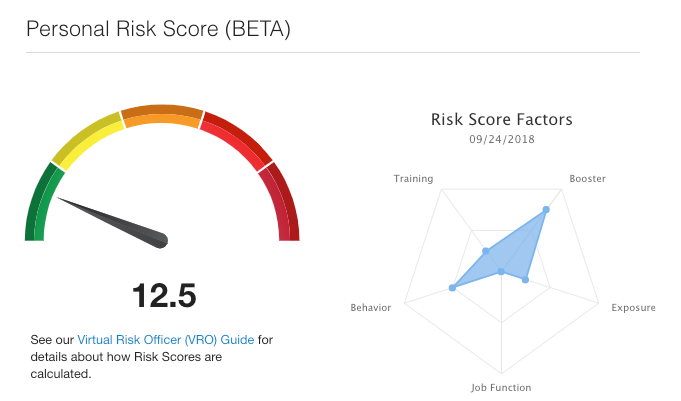 For more details about Personal Risk Score and what each graph represents, see Personal Risk Score Charts and Graphs in our VRO Guide. The personal Phish-prone Percentage of your user is displayed, based on the number of phishing test failures divided by the number of phishing emails delivered. The Phishing area displays all phishing emails delivered to a user that the user has somehow interacted with, whether by clicking, opening an attachment, or reporting the email as a phishing email through the Phish Alert Button (PAB). You can click or hover over each icon for additional information. 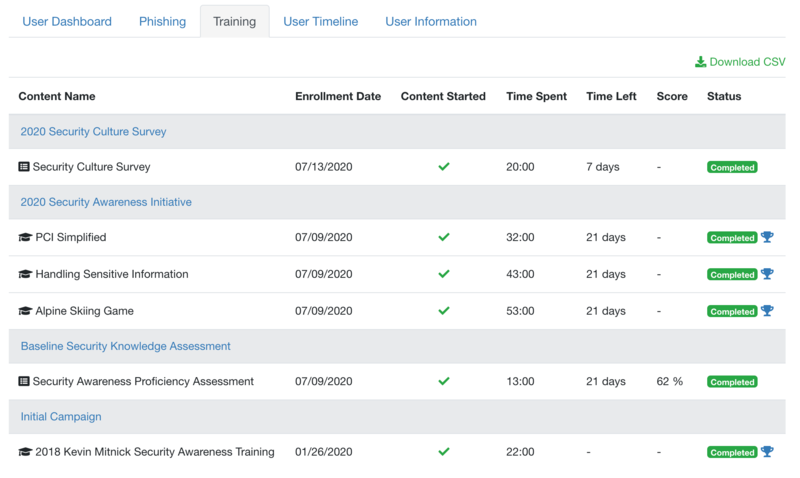 The user timeline, located at the bottom of your user's profile, shows a complete history of your user's interaction with tests and training in the console over time. 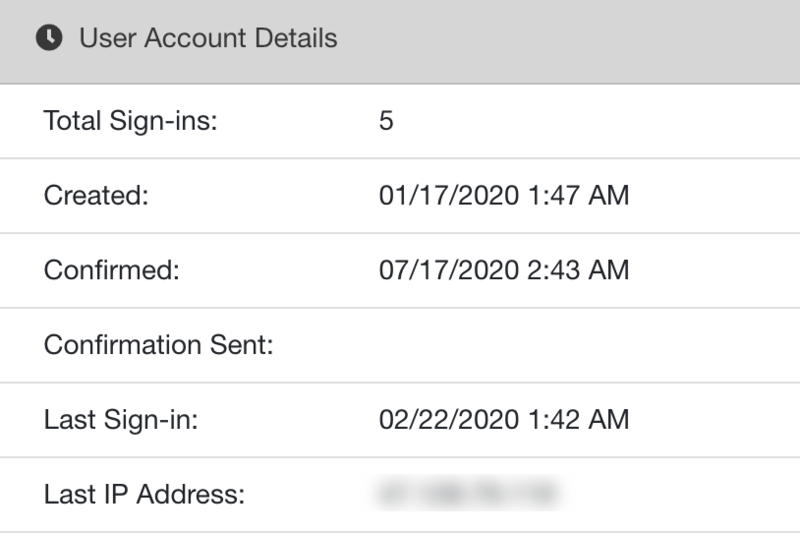 Data breach involvement events may appear on the timeline as happening before your user was added to the console, as they respect the dates that a data breach was reported. For example, a user who was added in 2018 may have been found to be part of a data breach that was reported in 2012. How Do I Import Users With a CSV File?